I’m really getting serious about music again. The problem is that inspiration is everywhere for me and I’ve got a twenty year backlog of ideas. As a result I’m constantly looking for a means to get ideas out of my head and onto paper. 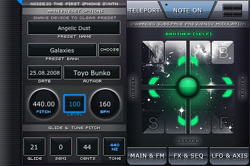 The Noise.io by Amido iPhone Synth is where I’m looking to fill the gap between head and MIDI files. The interface is really forward thinking… maybe to a fault. There are some simple UI concepts that Noise.io leaves out and thus makes the user experience clunky. Overall this is a good start for me. I’m hoping that Noise.io adds a few more features in order to make this serious tool. Who Owns the Space In Between?